Some days get hard, seemingly like the enemy is ‘hot on our trail” as he whispers us to wonder, ‘Have you been left on your own?’: leaving us feelings of exhaustion, worn out, tired of fighting and ready to give up. There is no fear or worry that God doesn’t understand. He sees the wars that rage within us and has an endless supply of strength for those who turn to Him. Through His word we can learn how to face those who oppose us without fear, rising above anything or anyone that we are threatened by. We’re not alone. Not ever! God won’t let go, though we may struggle with the lies of the enemy that He’s left us fending for ourselves in hard times, be reminded that the Word of God is filled with reminders, especially for you and I that He fights for us still today. No need to defend yourself. The Word never says this life will be easy. The Word never promises that we won’t get weary, or that we won’t face an enemy or even….that giant. The Word of God does say we can come to Him and He will give us rest. The Word of God does promise to fill us with the power of His Spirit and that His joy will be our strength. The Word does remind us that the battle is not ours but the Lord’s. The Word does say that we wrestle not against flesh and blood, but against the spiritual forces of darkness in this life. 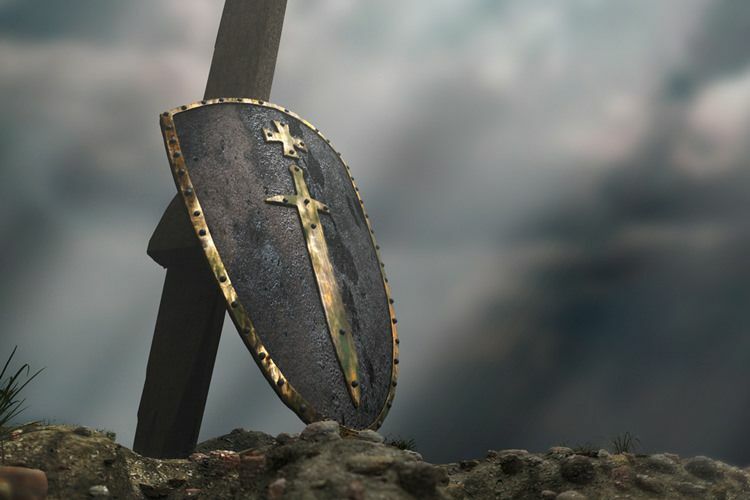 Wars are won by those who throw up their shields and slowly, and surely, push back against the enemy wall until it is to weak to stand any longer. In spiritual battles this comes through trusting God in every step, and standing strong even when you seem to be losing ground. When we do grow weary, what is important to remember is that God has a far better understanding of our capacities than we do ourselves. God is not letting us down or leaving us, He is growing us in our strength. If we are to be true soldiers in Christ’s army, we have to have full knowledge of just how strong we are in Him. We may fall, but we will never hit bottom. Because through life’s battles, God has shown us that when we fight with Him, we cannot be defeated. Finally, in Exodus 17, the Israelites were facing a fierce enemy. The Amakelites were approaching. They killed for sport and were on the attack against God’s people. Moses told the Israelites that as Joshua led the people in battle, he would go up to the top of the hill and hold out the staff of the Lord over them. God’s Word tells us that for as long as his hands were held up, the Israelites were winning, but when his arms got weary, the enemy began to overtake them. So Aaron and Hur came, and held up his hands. One on one side, and one on the other. And a miracle happened that day. Even though all odds were stacked against them, the people defeated this strong enemy. This story reminds us that some days, even the best of leaders, even the strongest…can get weary. Maybe today, you are feeling weary, discouraged. Take heart! God is near you, ready to work for you, if you would just ask Him and trust in His ability to defeat your enemy.